We are an electronics buyer in Mesa, Arizona, but if you happen to be located anywhere in this part of the state, for instance in nearby communities like Chandler, Gilbert, Apache Junction, Scottsdale, Tempe, or Phoenix, we are still well within your driving range, and we can make it to your advantage to come visit us personally at our pawn shop. Why GO to an Electronics Buyer? There are lots of times in everybody’s life when for whatever reason, there’s just the unexpected need for cash to cover a shortfall, or some unanticipated expense that simply can’t be managed through normal means. That’s where we come in to fill the gap, and provide fast cash to rescue you from whatever kind of financial hardship or discomfort you are experiencing. All it takes on your part is to have some kind of electronic device which is still in good operating condition and has value to other people. Our in-house expert will give you a fair assessment of the resale value of your electronic device, because its resale value is the actual amount that we might hope to recover when we sell it to someone else who is interested. You can rest assured however, that we provide the highest payouts of any pawn shop in the area, and we buy electronics as much as any other pawn shop in this part of the state. Just to give you an idea of the kinds of items we have bought from customers in the past, a partial list of those devices includes game systems, video games, flat screen TVs, DVD players and videos, Blu-ray players and Blu-ray discs, home audio systems of all types, car stereo systems and video systems, digital cameras and camcorders, GPS tracking systems, iPads and iPods, all kinds of video games for all different types of video systems, desktop PCs and monitors of all types, cell phones, and laptop machines of all types. 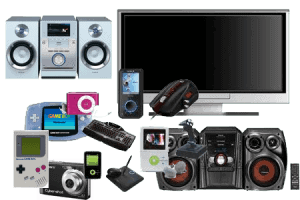 As long as you are the legal owner of whatever electronic device you bring into us, we can probably do business with you and give you a fair price for your valuable item. We recommend that for such items as game systems, computers, and televisions, that you bring in all cabling and any other required accessories, so they can be sold as complete systems with no missing parts. What if We Don’t Want to Give Up Our Electronics? In the event that you would prefer not to sell your electronic device and relinquish ownership permanently, we can set you up with a pawn that will provide you with the cash you need right away, and which will allow you to later redeem your electronics devices at the end of the three-month loan period, when your loan has been completely paid off. We will be glad to arrange it in any manner which works best for you, and provide you with the most flexible terms possible, so that you become one of our many satisfied customers, and we can expect to do business with you often in the future. Electronics We’ll Buy for Cash! This list isn’t exclusive! Here at Alma School Pawn and Gold, we pride ourselves on being able to get the vast majority of our customers fast cash. The beauty of a Pawn Loan is that your item is what determines whether we can get you cash. This means that no matter what kind of electronics you want to pawn with Alma School Pawn and Gold, we can get you cash. Call or visit us today!